This week, popular real-time traffic mapping app Waze introduced a new feature for social media users called Waze Unusual Traffic. Unlike most Waze alerts that require you to have the app installed, Waze Unusual Traffic is a series of Twitter accounts for major metropolitan areas. When traffic is unusually bad, the accounts will tweet warnings and information about the problem to drivers. Waze Unusual Traffic works by comparing current real-time traffic conditions to historical data to find problem areas. If Waze users have filed reports about the cause of an incident that’s causing delay, that information will be included in the tweet. You’ll also be told how much extra time is being added to your trip, be able to view pictures (if available) of the problem and learn whether the incident is resolving itself or getting worse. Waze will even provide a link to an alternate route to save you the time and hassle of sitting in bumper-to-bumper misery. 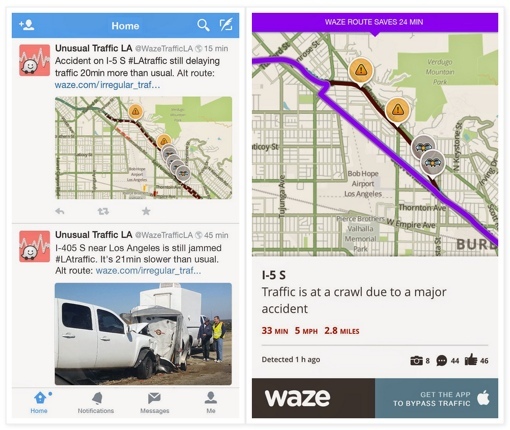 Waze Unusual Traffic is only in the beta stages of development, but already the company has made Twitter accounts available for 50 major metropolitan areas in the U.S. and around the world, including Boston, Memphis, Denver, Los Angeles, Amsterdam and more. You can find a listing of all the available Unusual Traffic Twitter accounts by clicking here. One of the coolest things about Waze Unusual Traffic is that you don’t need to download the Waze app to use it. You don’t even need a smartphone – just follow the Unusual Traffic Twitter account for the metropolitan area nearest you. Of course, if you do have a smartphone, Waze is worth checking out for its cool traffic jam progress bar and AMBER alert warning features. You can download the free app for Apple iOS and Android on the Apple App Store and on Google Play respectively.